If this is your yacht – or a similar size to yours, then you need read no further as this is a short post about the space below deck in a small boat with no standing headroom. This post is for Folksong owners and anyone interested in small boats. I would welcome feedback and tips. Feel free to use and improve any ideas you find helpful here. Shakedown sail – in the way, bodies learn then need to relearn. We were away at the weekend so yesterday, belatedly, was my first sail of the year. There were a couple of problems, so, while it’s still fresh in my mind, here’s a short description for Folksong owners and anyone else who might be interested. If, by my not keeping quiet about my mistakes, it sounds as if I have no pride, you’d be wrong, I have lots of pride, but as I get older I find I can take it or leave it . 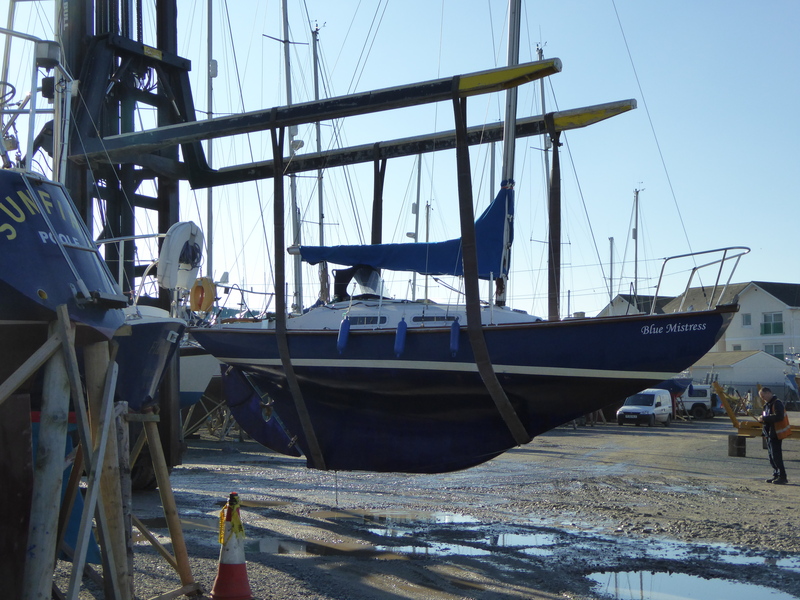 . .
Blue Mistress is due for relaunch this morning – complete with a new teak rubbing strake. Blue Mistress is slowly coming together. Because we won’t be back in the water before Easter, I have had time to tackle the planned jobs and some unplanned ones as well – like painting the floors of the quarter berths. I now know why I avoided this for so long. It meant forcing my 42 inch chest five feet down two 38 inch holes – cleaning, sanding and then one, two, three coats – shoulders hunched, arms outstretched, pushing an open paint-pot before me, having to work out how to use my right hand accurately and then how to worm my way backwards without touching the fresh paint. 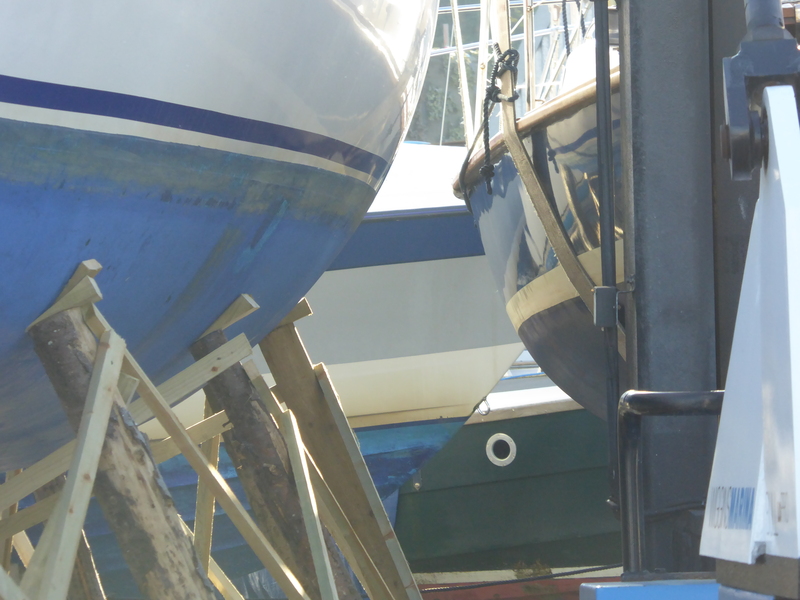 Blue Mistress was lifted in November and slotted into a tight spot between another yacht and a fishing boat – both much larger.